HÀ NỘI – The Ministry of Education and Training recently proposed raising teachers’ salaries, but it’s unclear whether this will be approved given the small portion of the State budget spent on education, according to experts. In a draft proposal for the amendment of the Law on Education, the education ministry suggested that teachers’ salaries should be increased. According to statistics from the ministry, currently, the average monthly income for a teacher with 15 to 25 years experience ranges from VNĐ7.2 million (US$320) for kindergarten teachers to VNĐ8.5 million ($370) for university lecturers. For new teachers who have worked less than five years, the figure is only half of that at VNĐ3.2 million ($142) to VNĐ3.9 million ($173). Reform for teachers’ salary actually was discussed several years ago when a study announced in 2012 by Nguyễn Thị Bình, former vice president, and her team, revealed that 50 per cent of teachers earn less than the education field’s average income which is between VNĐ3 and 3.5 million (US$140-164) per month, including allowances. The salaries and allowances are not enough for teachers to support themselves and their families, especially those who live in urban areas, the study concluded. The study also found that on average, teachers worked 13 years before making more than the average wage. The study’s authors proposed that the Government adjust its policies so teachers can rely on their salaries to make ends meet and don’t have to wait too long for raises. Nguyễn Khắc Thành, principal of Dân Hoà Secondary School in Thanh Oai District, Hà Nội, said he supported the reforms. 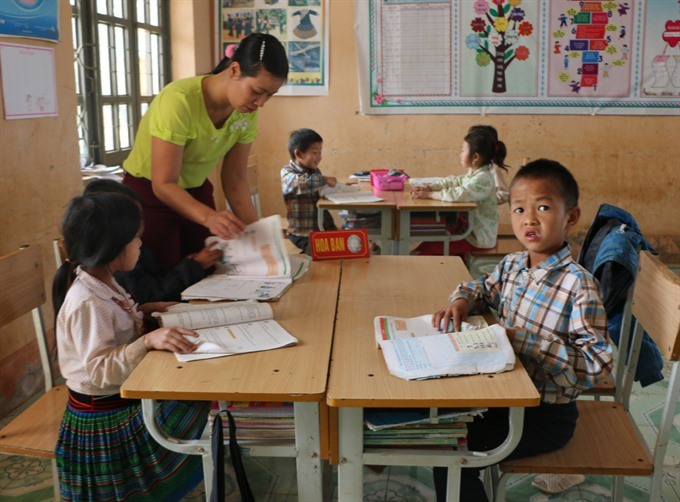 “If the salary is increased, teachers will be able to focus better on their teaching quality and do not have to worry too much about how to make ends meet,” Thành said. Trần Xuân Nhĩ, chairman of Việt Nam’s Association for Universities and Colleges, agreed. “Teachers have to be able to cover their expenses by their salary to be devoted to teaching. I think teachers deserve to have the highest place in the salary rankings,” he said. Although the need to make such reform was mentioned in 2013’s Resolution 29 on education and training reform, the situation was not made much better, according to Đào Trọng Thi, former head of the National Assembly’s Committee on Culture, Education, Youth and Children. Thi, however, admitted that such reforms would be challenging. “The number of teachers in the country is large, if we raise teachers’ salaries it means we have to cut the State budget for other components. People are willing to say: yes, let’s raise teachers’ salaries, but I’m not sure if they would agree for their salaries to be cut to make up for the raise,” Thi said. Thi also emphasised that support for teachers was critical to improve education quality. “If everyone in the society would think this through – they would not hesitate to make the sacrifice,” Thi said. Bùi Thị An, former NA deputy from Hà Nội, said the reforms could only be made when Government agencies are streamlined and work effectively. According to a report from the education ministry, Việt Nam has more than 1.2 million teachers, 272,000 education staff, and 154,000 education managing staff. However, Đỗ Hồng Cường, vice principal of Hà Nội Capital University, said salary would not be a fix all for the education sector. “Other measures need to be conducted along with salary reform, like improving education facilities,” he said. The proposal by the education ministry also suggested that more students be exempt from public secondary school tuition fees.